Although the sPzB 41 was classified as a heavy anti-tank rifle, its construction was much more typical of an anti-tank gun. Like the latter, it had a recoil mechanism, carriage and shield. The only significant feature the weapon had in common with anti-tank rifles was a lack of elevation and traverse mechanisms—the light barrel could be easily manipulated manually. The design was based on a tapering barrel, with the caliber reducing from 28 mm at the chamber end to only 20 mm at the muzzle. The projectile carried two external flanges; as it proceeded toward the muzzle, the flanges were squeezed down, decreasing the diameter with the result that pressure did not drop off as quickly and the projectile was propelled to a higher velocity. The barrel construction resulted in a very high muzzle velocity - up to 1,400 m/s. The bore was fitted with a muzzle brake. The horizontal sliding breech block was "quarter-automatic": it closed automatically once a shell was loaded. The gun was equipped with an open sight for distances up to 500m; a telescopic sight, (ZF 1х11 from the 3.7 cm Pak 36 anti-tank gun), could also be fitted. The recoil system consisted of a hydraulic recoil buffer and spring-driven recuperator. The carriage was of the split trail type, with suspension. Wheels with rubber tires could be removed, making the gun significantly lower and therefore easier to conceal; the process took 30–40 seconds. The guns' construction allowed toolless dismantling to five pieces, the heaviest of which weighed 62 kg. The last gun was built in 1943; the main reason for the discontinuance was the lack of tungsten for projectiles. This is a neat little kit from Bronco that includes not only the gun, but also its trailer. Apparently this is not the first boxing judging by the appellation in the title of the 'larger' steel wheels. The kit does come with photo etch, the small fret including mostly hand holds and brackets. The builder will also need to remove some bolt heads from a sprue runner for inclusion later. There are some who do not like this feature, but it does make cleaning up parts a lot easier as one does not have to deal with mold seams going through bolt detail. The gun can be modeled either ready to fire or with the trails together for transport. If the latter is chosen, then there is no reason to build the cart. Apparently the gun was normally towed on the cart ready for action. Once the gun carriage is built up, then one can start to assemble the gun itself. The barrel is a single casting and is designed to be able to move in elevation. There is no azimuth movement of the mount, but the gun was so light (as these things go) that it could easily be manhandled. The gun shield is well molded and of a double thickness. Most of the photo etch will be used on this part. The trailer is a separate assembly in and of itself. The major feature are the loading ramps on which the gun is loaded. There are storage containers on the trailer as well. The lower sections of the ramps can be modeled either in the transport mode, or lowered to off-load the gun. 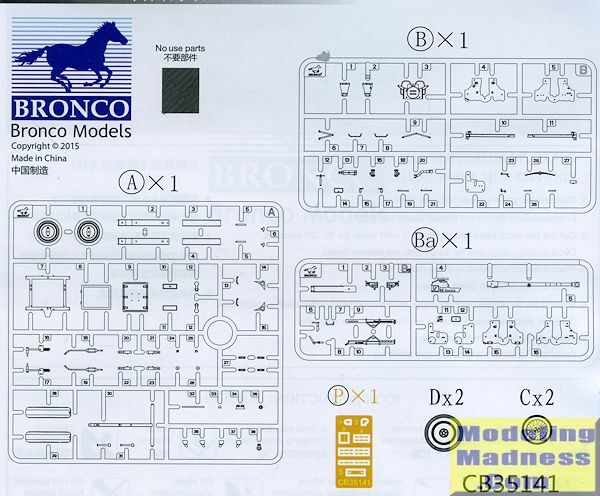 Instructions are well done and typical of Bronco, include color to show the use of the photo etch. There are no decals required and one can either paint their gun panzer grey or panzer tan. 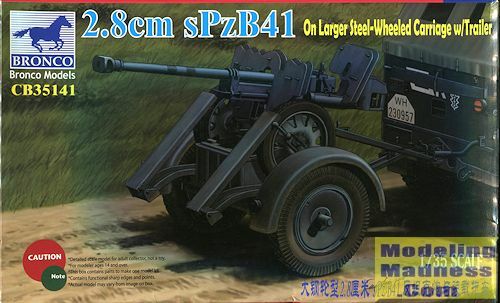 For those who like anti-tank guns or just want something small to fill in the spaces in their display, this would be an excellent choice. Bronco has a deserved reputation for detail and this kit is no exception. Thanks to www.dragonmodelsusa.com for the preview kit. Get yours today at your local shop or on-line retailer.